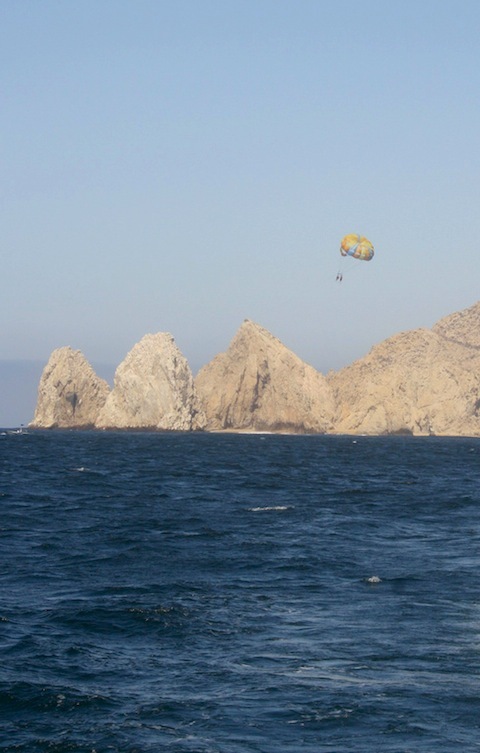 This is a photo of two people parasailing over Land’s End in Cabo. I took this photo while on a boat, approaching the arch and Land’s End. If you head to Medano Beach during a busy day, you will see the sky full of colorful parachutes floating in sun. Parasailing is quite the popular activity as the birds eye view of Cabo is stunning! If you want to go parasailing in Cabo, there are plenty of vendors who are willing to offer you the experience. Simply approach one and ask how much it will cost to go parasailing. You can often haggle the price. Most parasailing trips last about 10 minutes and cost around $30 – $40. You can go parasailing by yourself or in tandem, meaning that two people can go at the same time. In tandem trips are usually more expensive as more than one person is going. There’s nothing like being up in the air and seeing the Arch and beautiful sparkling waters of the Cabo San Lucas Bay! Have you gone parasailing in Cabo?